Our vision is to assist each senior adult to live up to their full potential by addressing spiritual, emotional, physical, social, and security needs. We do this by providing caring communities staffed by people who love the contribution they make! 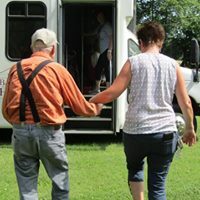 The Baptist Home is a unique ministry born out of a love for the elderly, who are often forgotten members of our society. We see the value of each life, and are dedicated to celebrating those lives in a caring community. Each year we provide over $2 million in benevolent care to our residents, and are committed to this principle at our deepest level. We have been awarded a $100,000 challenge grant through the Mabee Foundation towards the chapel community center on our new Ashland campus, but need to raise the remaining funds before next July to secure that grant. Have people share our ministry and story, by facebook, other social media, or word of mouth! The Baptist Home added 11 new photos. Busy and fun times for all!! Could you please put which facility is being addressed after The Baptist Home? The Baptist Home added 15 new photos. What a wonderful tradition by these lifelong Christian servants and ministers. The Baptist Home added 12 new photos. I love the smiles on everyone's faces that is pure joy!!! The Baptist Home added 14 new photos — at The Baptist Home, Ozark, Missouri. Thank you for bringing in the shopping for the ladies. I know they loved it. With tax season upon us, now is a great time to check out some of the financial resource materials at The Baptist Home website; starting with these 6 questions about taxes and IRAs. If you have additional questions regarding this topic or other tax related issues leave them in the comments below or e-mail us at desk@thebaptisthome.org. The Baptist Home added 15 new photos — at The Baptist Home, Ozark, Missouri.